Four (4) fat scrapers of different shapes and sizes, five (5) flexible extendable pph-shafts (length 2m, M12 thread). Cleaning of fat ducts and air ducts from heavy dirt. The cleaning can be finished with a brushing device. 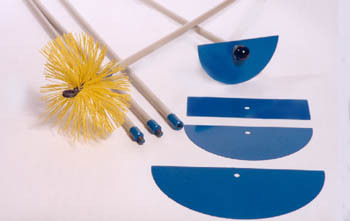 Shafts: very flexible plastic with M12 metal thread on each end (intern and extern); fat scrapers: spring steel.